Con Edison has helped thousands of residential and business customers reduce their energy bills and improve New York’s environment by becoming more energy efficient. In addition to energy efficiency programs, the company also promotes the benefits of renewable energy – specifically solar – for select businesses and communities. The company continues to adapt as more customers look to distributed energy resources to meet their energy needs. To date, close to 5,000 residential and business customers in our service territory have rooftop solar arrays - tripling the amount of solar production in New York City and Westchester in just two years. Through surcharges like the renewable portfolio standard (RPS) on customer bills, the New York State Energy Research and Development Authority (NYSERDA) is able to offer customers incentives to help offset the cost of installing arrays. State net metering laws also help to make solar installations more economically attractive. 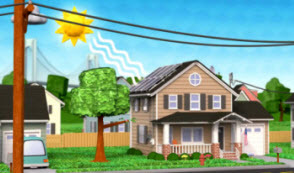 Net metering is a billing mechanism that credits customer-sited distributed generation owners, most often solar, for electricity their system feeds back into the grid. (See video) Typically, the credits from energy exports help offset a customer’s bills by reducing their volumetric charges (running their meter backwards when exporting). Residential customers that produce more power than they use annually get a check back from the company for the value of the energy. Net metering credits include a subsidy that increases costs for other customers on the system. The argument goes that costs for maintaining the grid, responding to storms and preserving reliability shift from net metered customers to others in their community. While Con Edison continues to support distributed generation, specifically renewable resources, groups internally and externally are looking at net metering laws with a critical eye. As more customers take advantage of renewable resources, the impact of cost shifts may increase to a smaller group of customers. The company and industry must ensure the costs of net metering don’t become a burden to customers unable to install distributed resources of their own. The Company believes that a successor to net metering, which will be discussed in the REV proceeding, could eliminate the cost shifts inherent in net metering while still providing distributed generation customers with fair compensation for their exported energy. Beginning June 1, Madison Square Park in midtown Manhattan will transform into a major public art installation. A 500-foot long sculpture, broken up into six sections, is currently being installed horizontally above pathways and visitors heads. The outdoor sculpture, the largest and most ambitious ever mounted in Madison Square Park, will consist of mirror-polished discs that will create shimmering canopies above park visitors heads. The installation, called Fata Morgana, after the horizontal mirage that forms across the horizon line, was designed by acclaimed New York based artist Teresita Fernandez. 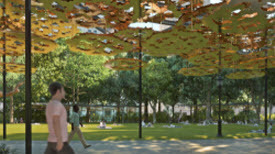 The massive metal art display will be reminiscent of foliage and is designed to create abstract flickering effects as sunlight filters through the intricate designs and casts a golden glow across park pathways. Unlike many works of art, Fata Morgana is designed to be experienced in person. 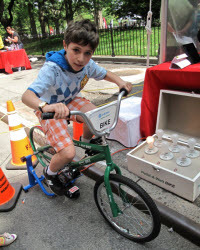 Con Edison has been a long supporter of Madison Square Park Conservancy, a not-for-profit organization whose mission is to protect, nurture and enhance Madison Square Park. Our partnership helps the almost seven-acre public green space maintain their beautiful gardens and horticulture program as well as run world-class programming and serve as a major midtown greenspace. The park serves as a distinct example of the company’s support of arts and culture and the environment. Con Edison volunteers have also helped run the park’s annual Spring Kids Fest which includes games, arts & crafts and face painting. This spring volunteers can assist Madison Square Park with their annual gala, Party in the Park. To sign-up or get more info, visit the volunteer website. Madison Square Park welcomes more than 50,000 daily visitors including families, public school groups, tourists and daily office workers who enjoy the park during lunch or after work. Fata Morgana will be on display through the winter, allowing visitors the opportunity to experience and interact with the piece through all four seasons. Be sure to stop by for this unique experience. A brownfield is a piece of property that, through industrial or commercial use, has been contaminated with hazardous waste or pollutants. The potential costs of remediation for any developer looking to make use of the property can create financial uncertainty and make the property less attractive. The state Brownfield Cleanup Program (BCP) provides tax credits to developers working with these contaminated properties to spur their redevelopment and also clean-up. The BCP was scheduled to expire at the end of this year. Despite many successes, the program had been criticized for providing tax credits to residential and hotel projects downstate that would have gone forward without the credits. The Governor and Legislature had been negotiating a comprehensive reform of the program for several years and finally reached an agreement in this year’s state budget. The reforms also included a new streamlined “BCP-EZ” program. BCP-EZ is a fast-track option that provides a liability release without tax credits. Con Edison has been supportive of the streamlined program, but was originally not eligible to participate. After working with lawmakers, the final agreement expanded the scope of eligibility and Con Edison will now qualify. This May, the World Science Festival (WSF) returns to our area. WSF is a can’t miss New York City event which aims to spark a curiosity in science in all five boroughs. Con Edison supports over 40 different nonprofit groups that manage and cultivate New York City and Westchester's vibrant parks and greenspaces.